Hope you've been having a wonderful day! Today has been VERY STRESSFUL...I'm supposed to go do anything I'm asked to do STAT any time I'm called...I also managed to cook most of Christmas Eve's and Christmas Day's food today...It is late now and I just now got another phone call...guess I have to RUN again...I am so tired til I am not sleeping much at all at nites...but it apparently doesn't matter...I know...I NEED to be ASSERTIVE!!!!!!!!!!!!!! But when I am and I DO BE ASSERTIVE, I'm told it's MY FAULT, by the person (s), that I should ignore them when they call...ERRRRRRRRR!!!!! hey sweetie.. I dont know if you just left this as your entry.. or your keying as I key.. :).. how is mom doing? better I hope.. please give her a secret hug for me.. :).. thanks..
Hello to you! Can we say RAIN today in S.C.????? Most of the day! But, thank the good Lord for it! Rain clears and cleans the air and waters everything...keeps the dust down, etc. Today was another very busy day...after prayer this morning, I began with cleaning house and washing Hubby's and my clothes, as well as Mom's....I also made up 3 pans of homemade biscuits and put them into the freezer to be taken out tomorrow about 1 hour before church and bake them in the oven and take them to church for our annual Thanksgiving supper at church! Really looking forward to that! I also decorated 18 little cake squares (each about the size of a large cupcake) to take for one of the deserts at church. Looks like little red flowers with green leaves on white icing on each of the cake squares...that's in the freezer also, to be thawed out tomorrow so will be ready to take tomorrow nite...I also fixed Daughter's lunch when she came by on her lunch break...She showed me her arm, which is slowly healing from her fall and gash in it which resulted in 12 stitches in it...her's is her left arm, same as her Grandma's is left arm, too...both of them fell days apart and injured their left arms!!!!! But Mom broke hers....later after Hubby came home and ate, we went and visited Mom who is still in the hospital...she'd asked me to bring her a fried egg sandwich, which I did, cause she said she didn't eat much at lunch, just the chocolate pudding...She is still in the bed and refusing physical therapy...said she hurts too much to get up and walk other than with the assistance of nurses to the bathroom...After we left from there, we drove about 15 miles to get a vacumn cleaner belt....Then we went back to the mall again and picked up my ring again...it is beautiful! Then Hubby and I walked a little in the mall....on the way back home, we listened to Christmas music already playing on the radio! Of course I LOVE Christmas music...I don't mind listening to it in the summertime, even! Food today: 2 toast w marg, 1 fried egg, 1 baked fish, 2 cups baked okra, 1 McD's cheeseburger (small one), and 1 McD's walnut and fruit salad. Well, going to read some entries...thanks for reading...thanks for your encouragements!!!!!!!!! Remember....Jesus loves you, and gave His life for your salvation....and he is the only way to be saved! Will you ask Him to be your Lord and Saviour today? Progress as of today: 50 lbs lost so far, only 0 lbs to go! Here we have to listen to Christmas carols in the summer since we get Christmas in summer lol! I have had dreams of snow and carols for Christmas....hope i can experience it one day....Enjoy your church Thankssgiving celebrations...sounds like fun :) And the food you made sounds so yummy, please post me a cupcake!! hey sweetie.. :).. I do hope mom and DD's are gets all betetr soon :).. I love the Christmas music as well.. :).. have you har the Clay Akins cd? I love his voice on the christmas songs.. my fav. is.. Mary did you know.. so pretty.. :).. Sounds like you had a very busy day as usual!! I don't know how you do it all! I'm so glad you got your ring and now it's where it should be..on your finger. Do you find yourself admiring it all the time? Sounds beautiful! I am glad that someone enjoys listening to Christmas music before Thanksgiving LOL. Have a great day! Hello to you! It was sunny, warm (high in 60's) day here in S.C. today! Hubby had the day off, so I surprised him by taking him out to Shoney's breakfast buffet...then we went and got a tire put on Hubby's truck...then we went and did a little shopping for my Mom, who is still in the hospital recovering from a a fall that occurred on Oct. 29th and resulted in a broken arm and a lot of bruising...then we went and visited her. When we went in, she was sitting up in the loungechair, but with her head bent over, holding it up with her good hand. She wanted to get back into bed and said she'd been sitting up 3 hours and needed assistance to get into her bed, but I encouraged her to try to get out of the chair which was by her bed and onto the bed by herself as it was about even...which she did with me standing by her with my hand on her back and assuring her she could do it and she did! We visited her a while, then left and went to get Hubby's rear-view mirror reglued that had fallen off his windshield last nite...then we went to Mom's apartment and cleaned it real good for 90-day inspection that is coming up in a couple of days. Then after this, Hubby suggested we go ahead and eat out for supper tonite instead of tomorrow nite as was planned when we would again pick up my ring...so we did...buffet...but I was GOOD!!! Total for today about 1500 cals! great calories! you have been so busy with home and family things! You are really calm and in control! I envy your ability to do it all! You did great with your calories, it is really hard to go to a buffet and do good. Good day for you! Thanks for your comments on my diary. I did enjoy the coconut cake. I didn't do too badly for the day, I guess. Needed to exercise more. Hang in there. I know you have alot going on. Praying for healing and peace for all. Congrats on the great day! Lunch: 2 cinnamon rolls, 410, 1/2 banana, 50. Snack: 1 Nutty Buddy ice cream, 210. Snack: 1 fatfree low cal bologna and 2 lite wheat bread, mustard, 100. Snack: 1 cup canteloupe, 50, 1 banana, 100, cheddar cheese, 150. Supper: 1 baked hamburger, ketchup, mustard,200, 1 corn on the cob, 200. Snack: 2 fat free chocolate fudge cycle ice creams, 200. Late Snack: popcorn, 200, chicken weiner, 100. It is not easy to think about eating more to maintain, cause I'm not used to doing that. Exercise Plan: Walking at the farmer's market and on the treadmill here at home and playing the piano. Progress as of today: 14.5 lbs lost so far, only 0 lbs to go! What a beautiful day. I love farmers markets. A great way to get good produce and help your local community. Have a wonderful day! Sounds like you had a very busy morning. And you're doing great! Maintaining already!! Thanks for your comments. Have a great rest-of-the-day! Yea i saw the Hurricane coverage on Sky News, it seems its the beginning of the season and they already named the first one Hurricane Alberto. I just pray that it loses it momentum before reaching the coast. Your eating is great and varied like always. Dont force yourself to eat if you dont feel like it. Carry on with this way of eating and see if you actually still lose a lot of weight, if not you can keep on with it. If you are still losing but dont feel like eating you can perhaps take supplemental energy drinks. They are caloric but dont fill you up that much. Sounds like another lovely day with your mama.. :).. thats always graet!!... your Nutty Buddy ice cream is yummmmmm.. did you get them form DQ? I love those.lol.. Your foods for the day sound delicious. To answer your question, I basically put whatever I have around in my turkey soup! I like to roast whole turkeys and turkey breasts in the winter months and I freeze the legs, wings and assorted scraps and bones. I had a large collection of frozen stuff so I used that as the base and added onions, garlic, fresh peppers, scallions and some fresh dill that I had, as well as other herbs. I also added a couple of ancho peppers since I like some kick in my foods. I added some spiral pasta and let the whole thing simmer in the crockpot for a day. I've frozen it into small portions and it reheats nicely! Breakfast: 1 egg, 3/4 tbs oil, 1 lite wheat toast plain, 1 banana, 300. Lunch Buffet at Golden Corral Restuarant with Hubby: 3/4 baked sweet potato, 1 yeast roll, 1/2 container honey butter, 1/4 small piece cheese pizza, 1 very small salad, 1/2 cup vanilla soft serve ice cream, 1 tbs choc icing, 1 very small hushpuppy, approx. 700 calories. Snack: 2 very small pieces of Russell Stover chocolate candy(yes I got a small 4-pc. box for 99 cents at Walgreens), 130. Snack: 2 cups watermelon, 100. See 'Who Would've THUNK it????' below. Supper: 1 small cheese pizza, 410. Snack: Will be refreshments at birthday party at church, but I will try to just mainly 'sample' them, if ya know what I mean, hehe. (Back from church now...I had 2 tiny fried chicken legs (from wings), a few tiny pieces of fruit, a few peanuts and potato chips, and about 1/3 pimento cheese sandwich, about 350 calories. Late Snack: Fatfree chocolate fudge cycle, 100. As always, LOTS of water! Who Would've THUNK it???? I actually enjoyed the watermelon this afternoon, which has become a big part of what I eat regularly now, MORE than ANY of the above!!! Watermelon is sweet, high in fiber, low in cals and fat, VERY FILLING, and I like it! I enjoyed it more than the ice cream, the chocolates, the sweet potato, the honey-buttered hot yeast roll, etc. I also feel very good eating it, cause I know it's not fattening, and I can only eat just so much of it (usually about 2 cups) and I'm full. Total Cals for today: 2040 ...(estimated)....I banked some cals yesterday (Only had estimated 970 total yesterday) for today. Note: I was very 'business-like' with eating at the buffet restuarant today. Each time I tasted something, I silently asked myself how it tasted and if I REALLY wanted to eat it....I realized I wanted to eat for COMFORT, not for the taste of the food, so I wouldn't allow myself to do that. I also realized that because so many people were around me eating in what seemed 'wild abandon' (hehehe!!!) that I felt like I was 'SUPPOSED' to eat a lot. I tasted a few things but the flavor was bland, so I didn't eat but a tiny amount of a few things I didn't write in lunch, (steak, fried chicken, carrot cake, corn, mashed potatoes and gravy), but I did include the small calorie count for them in the lunch calories. I have been at goalweight before. I was at 205 in 1998. I lost about 50 lbs in a year. After that, I got down to 150 which was my goalweight and mostly stayed at 150 goalweight for approximately 6 years, up until last fall/winter of 2005, give or take a few on either side. I even got down as low as 132 one time, which was much too low for me at my height, 5'8" and medium build...so I regained. I thought about making 150 my goalweight this time, but I decided that 155 and size 12 was fine. Anyway, I was Maria7 on here before if you want to check that journal out. I started that journal here in December, 2000. I lost my password one day and couldn't get on DD and wasn't sucessful in making contact with the one over DD at that time, so I became Maria 777 that you know now. Thanks for the comment. Yea i spoke to a psychologist a while back, are actually still seeing him once every few months (it gets too expensive lol!). Well anyway he also spoke about false guilt now that i remember it, but i cant recall why i do have this. Tell me if this makes sense to you: Im feeling guilty and are taking the blame for living because of mistakes that my parents made? Its like i have this constant battle in my head. The one little voice says: "Well your parents did what they could at the time, and they love you dearly, they just want the best for you, like they always have." The other voice which is see as the evil one usually sounds like this: "You need to make your own decicions, you dont have to listen to what they want, its about what you want." Well in the end i feel guilty and i feel like a bad person and that is taking its toll emotionally and spiritually on me. Hubby and me played tennis today and i became totally numb, i couldnt play anymore, and it wasnt because of tiredness etc, i was just numb. Anyway, dont want to go on too much about this, thanks for listening. You said you are talking from personal experience, you also feel guilty about your parents or regarding them? I guess by hearing about other people in the same situation like me i will understand myself better. Hiya darlin :).. I do so remember you as Maria 7..:).. I was mommyoftwo.. :)..
good for you for taking the time to evaluate your food today.. I know all about eating for comfort.. and eating because it taste good.. lol.. now I eat to be healthy :)..
ok I am off to beddy by.. or may just watch some tv.. everyone is gone.. they went to the drive in... I dont care for the movie..xmen.. so I am doing laundry..lol..
Getting ready to leave to go do some errands for my Mama. She has a few groceries she wants to send for. Plan to also pick up some more fruits at the grocery store today....watermelon being one of them...at 50 cals per cup, that is a good snack replacement for the 300 calories or so candy bars I used to eat....and more filling....and it is real sweet and fresh and good to eat. I might get a canteloupe and a few bananas, too. Y'all know I LOVE sweets, hehehe! Breakfast: 2 lite wheat breads, 1 barbequed grilled roasted chicken thigh, no skin, 300. Snack: 1 cup red seedless grapes, 50, 2 cups canteloupe, 100. Today's Cals: 970 or so, banking some for Sunday. I finally found out how to reduce the picture sizes I put on here...check out the flower below this entry that I just put on here today...Thanks Biscottibody 59, for the advice..I kept on til I figured out how to do it...this computer has a different program than my other one had. Hubby and I walked to the end of the road and back (about 1 mile round trip) for exercise. It is so GREAT to see you so positive!!! Have fun today!! SO lucky to be that tall!! Thank you for your support and your comments!! It is SO nice to know I am surrounded by others who are so AMAZING! Mmm... watermelon. That sounds so good. I think I will get some tomorrow. What a great idea! Thanks for the comment you left me, and for saying you would pray for me. That means a lot to me! Hello sweetie.. :).. sorry I didn't get here till late.. but mu family was still on the road from Kentucky and I didn't want to hold up the phone line in case something happened.. they got home at 10:30.. then I had to hear all about it :)..
parchment paper is what they wrap meat up for the freezer.. its not wax paper. I have some of that..lol.. I have looked at both dollar stores here in town and they don't have it.. so I will look at wal-mart next.. or Krogers where I buy groceries.. :)..
you flowers are beautiful :).. and its much better that you have re-sized them :)..
Have a great church service tomorrow.. and a good lunch.. eat something yummy for me.. hehe..
Breakfast: I had a craving for 'fried bread' or 'flapjacks' or 'homemade pancake', as some might call it but I grew up calling it fried bread and so I measured out 1 tbs veggie oil in the frying pan, and then I measured out 1/4 cup self-rising flour in a cup and mixed in just enough water to make it into a mud-consistency paste and poured the batter into the hot frying pan with the oil in it and fried a little piece of fried bread...I put that on a plate and scrambled an egg and fried a 20 cal pc of ff bologna to go with it...then grabbing the syrup and a glass of water, went out on the front porch and sat there listening to the birds singing and smelling the sweet flowers while I had my breakfast...I saved just enough fried bread to go with about 1 tbs syrup...and that was my breakfast, 325 calories. Snack: 2 cups watermelon, 100. Lunch: 1 whiting fish and 1 and 1/4 cup okra, oven-baked, and 1 tbs ketchup, 200. Snack: 1 chocolate fatfree fudgecycle ice cream, 100, and 1 large corn on the cob, microwaved, 200. Snack: Another fatfree chocolate fudge cycle ice cream, 100. Supper: 1 whiting fish and 1 tbs ketchup, 135. Total Cals estimated today: 1160. Progress as of today: 14 lbs lost so far, only 0.5 lbs to go! I love fried, bread aka flapjacks.....that wonderful oily bread taste with the sweet honey or maple syrup! Oh how i crave that now! Especially with TOM here hehehehe! I say if you crave something, give in to a small amount of it, otherwise its going to come back and haunt you later. I love chocolate with orange, my favourite is the dark chocolate covered orange rind, the bitter and the sweet is just delectable! HEY SWEETIE..i AM AT WORK.. EVERYONE LEFT ME..LOL.. SO i CAME TO READ.. HEHE.. i DONT HAVE ANYTHING ON MY EBAY RIGHT NOW.. BUT MY NAME IS MONET0329 ON THERE.. :).. I DONT ALWAYS SALE ALL THE TIME.. JUST EVERY NOW AND AGAIN.. When I was a kid in Ohio, fried bread, to us, was dipping a slice of bread in egg and frying it, which now I know as french toast. Funny how things are different in different parts of the country. Good job resisting those Russell Stover chocolate cravings. Sounds good though. Nope.. I dont have a web page.. just sale every noe and again.. :)... add me to your fav sellers.. and you can check every now and again hehe..
have a great night hun. lub ya..
WOW! You are just doing SO AMAZING!! I love those pink flowers!! SO PRETTY!! You asked how tall I am? I am 4'11 :( Wish I would have atleast made it to the average of 5'2, but no such luck! How tall are you? Hello to you!!! Hope y'all enjoy the 4 flower photos below. Breakfast: Grilled barbequed chicken thigh, no-skin, 200, 1 lite wheat bread, 40. Supper: 1 grilled hamburger on bun with chili, ketchup, lettuce, lf mayo, mustard, onion, 300. Snack: 1 large fresh ear of corn, microwaved, 125. Late Snack: 1 nutty buddy ice cream, 210, and 1 banana, 100. Hiya sweetie.. sorry.. today was a work day.. so nope.. no fun there..lolol.. then I went to my mil's with dh while he cut her grass.. then came home and talked to my friend Beth on the phone for an hour.. then a show came on I wanted to watch.. hehhe.. then I went to my low carb forum I am in.. and now.. here I am :).. the flowers are very pretty :).. thanks for sharing.. :)..
glad you had a great day hun.. hugsss.. Very pretty flowers. 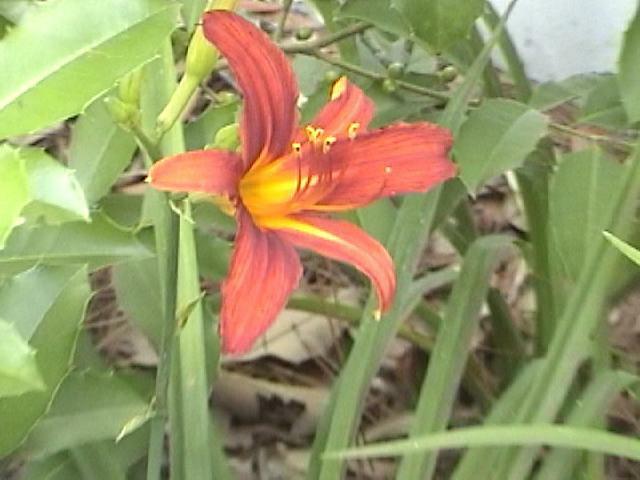 Especially the daylily! Have a great day and thanks again for going through the trouble! Gorgeous flowers Maria, thanks for sharing! !